Savory, yet bursting with bright notes of citrus. This Brazilian stew is the perfect pick-me-up in the winter or a beautiful simple soup for when you want something simple and delicious. 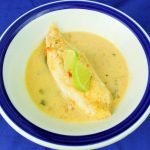 This stew will gently awaken your taste buds, first with the bright notes of citrus, followed by the savory tilapia, and trailed by the sweet coconut. Eating this heavenly soup is an experience, and a great way to fuel your new dancing habit. In a bowl combine all the ingredients for the marinade (tilapia, paprika, lime juice, onion, salt, and garlic). Toss the fish so that it is evenly coated in paprika. Let the fish marinade for at least 1 hour. After the fish has had time to marinade, prepare the onion, garlic, bell peppers, and tomatoes for the soup. Heat the olive oil in a large pan over medium heat, make sure the pan has a lid. Add the onion and a pinch of salt, and cook until it has taken on just a bit of color. Add the garlic. Wait 30 seconds, then add the bay leaves, bell peppers, and tomatoes. Cook for 30 seconds, then move all the vegetables to the outer perimeter of the pan. Add the tilapia, and all of the marinade to the pan. Make sure that the tilapia is in full contact with the bottom of the pan. Pour the chicken broth and coconut milk over the fish, then put a lid over stew. Let simmer for 5 minutes, then serve.